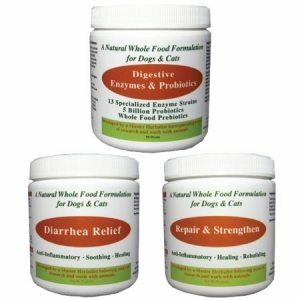 Together, these three products form the best natural support for dogs with bowel disease, irritable bowel syndrome, inflammatory bowel disease and colitis in dogs. 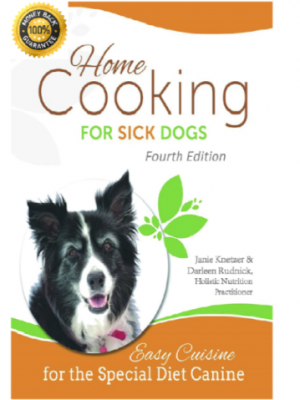 This package is designed to get your pet on his or her way to better bowel health long term and naturally. The Diarrhea Relief formula is a specially formulated blend of organic herbs, fibers and probiotics chosen because of their unique ability to help treat and relieve diarrhea caused by a number of conditions. It works in tandem with the Digestive Enzymes and Probiotics Formula (made with 13 different strains of plant enzymes and probiotics that help dogs and cats be more efficient at digesting their meals). 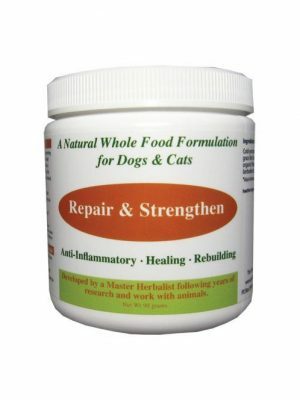 The Repair and Strengthen formula (made to help both heal and support the digestive/GI tract) for a full gut experience to help even the most troubled dog or cat get a handle on their GI symptoms. These products can also help with canine IBD, leaky gut syndrome, certain nutritional deficiencies, autoimmune disease, inflammation of the GI tract, food allergies and arthritis. Diarrhea Relief formula – Mix ¼ teaspoon of powder for every 15# of body weight with a small amount of water to make a paste. Give with every meal. You may increase to 2 to 3 times that dosage if your pet is having more serious issues with diarrhea. If possible, try to take a day or two off a week to let the system heal itself some as well. Digestive Enzymes and Probiotics Formula – Give your pet ⅛ teaspoon for every 30# of body weight. If possible, mix with a small amount of water and give with food. Give with every meal. If this is your pet’s first experience with Digestive Enzymes and Probiotics Formula, start with a quarter of the dose and work your way slowly up to the full dose. 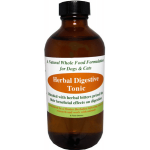 You may double the dosage temporarily to help soothe more intense digestive issues. Repair and Strengthen formula – Give ½ teaspoon for every 20# of body weight two times daily. If possible, give formula 5 – 10 minutes prior to each both breakfast and dinner, mixed with a small amount of water to form a paste. It can be mixed with food if absolutely necessary, however, but it is best absorbed on an empty stomach. As your pet adjusts, you can gradually increase to twice the suggested dose. If possible, try to take a day or two off a week to let the system heal itself some as well. Diarrhea Relief formula – Store at room temperature away from heat or moisture. Consult your veterinarian or holistic veterinary healthcare professional if the diarrhea does not resolve or worsens. Digestive Enzymes and Probiotics Formula – Store in the refrigerator. Repair and Strengthen formula – Store at room temperature away from heat or moisture. Discontinue immediately if any unusual side effects occur and contact your veterinarian. Diarrhea Relief formula – bacillus coagulans, chamomile (Matricaria recutita), chia seeds (Salvia hispanica), fennel seed (Foeniculum vulgare), psyllium seed husks (Plantago ovata), rosemary (Rosmarinus officinalis), slippery elm (Ulmus fulva). Digestive plant enzyme blend (492 mg) : bromelain (350,000 FCCPU), protease (4.5 – 21,000 HUT), protease (3.0 – 50 SAPU), protease (6.0 – 2,000 HUT), peptidase (500 HUT), amylase (5,000 DU), lipase (750 FIP), glucoamylase (6 AGU), cellulase (350 CU), hemicellulase (250 HCU), maltase (50 DP), alpha-galactosidase (50 GaIU), beta-glucanase (10 BGU). Probiotic blend (5 Billion CFU/131 mg) : DDS -1 strain of Lactobacillus acidophilus (1 billion). Natural Prebiotic Dietary Ingredients (100 mg) : chicory root (50 mg), fennel seed (50 mg). All ingredients are sourced from reputable manufacturers and are all natural and organic.